Sign Earthworks petition to release Munkhbayar! 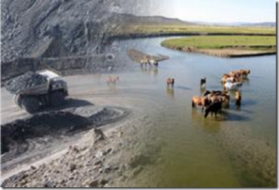 Earthworks urges You to tell Mongolian authorities to protect their environmental law!!! In 2009, Mongolian activist and Goldman Environmental Prize winner Tsetsegee Munkhbayar successfully convinced Parliament to pass long overdue protection of Mongolia’s precious water resources from mining’s impacts. In response to Munkhbayar’s success, the mining industry is pressing the Mongolian Government to cancel the implementation of this law in exchange for increased gold production. Munkhbayar and 2 of his colleagues were arrested when protesting changes to the law outside Parliament — and have been sentenced to 21 years in prison. And while Munkhbayar is sent to prison, the law he fought to protect is in greater danger than ever. The next few weeks are crucial to convincing the Mongolian Parliament not to weaken the law and to take measures to implement it properly. Help advance Munkhbayar’s vision of defending Mongolia’s water resources from dirty mining. TAKE ACTION: Urge the Mongolian Parliament to condemn this travesty of justice. Urge them to protect livelihoods and clean water in Mongolia clean for now and future generations!